Nature! It’s What We Do, and You Can Too! 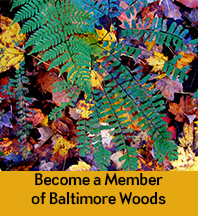 Baltimore Woods Nature Center offers many opportunities to take an active role in environmental stewardship. 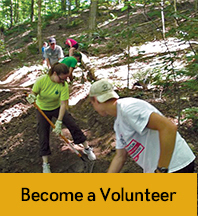 We are always in need of volunteers to help with an array of projects, including trail and facilities maintenance, office projects, event committee work and even baking. Stewardship comes in many forms, and financial contributions are also critical to our continued success. Monetary gifts help to maintain our trails, fund camp scholarships, defray general operating costs, and increase our endowment fund. Donations of gently used or new items on our Wish List are always appreciated. Among other benefits, members enjoy discounts at our gift shop, reduced fees for our public programs, and discounts at over 150 nature centers across the United States and Canada. 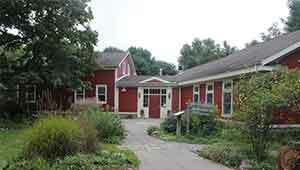 Click here for a list of reciprocal nature centers. Stewardship comes in many forms, and financial contributions are critical to our continued success. Monetary gifts help to maintain our trails, fund camp scholarships, defray general operating costs, and increase our endowment fund. 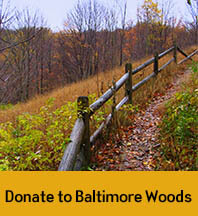 Click here to make a donation to The Woods. Whether it be contributing to the health of our natural world through maintaining the land, or being a friendly, helpful face around the Interpretive Center, each volunteer is essential to keeping our organization running smoothly. 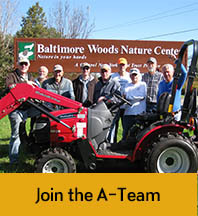 The A-Team is constantly working on projects to maintain the land around The Woods, and make it enjoyable for all of our visitors. They have built amenities such as our outdoor pavilion, the back deck of our Interpretive Center, a bridge over the stream on the Valley Trail, the Zen Garden, and the Pole Barn. They also complete tasks like mowing the lawn, removing snow in the winter, and a lot of trail maintenance! Help a child make memories! 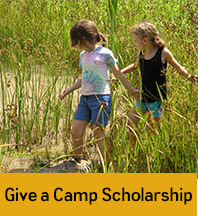 Donate to our camp scholarship fund and help provide a summer full of memories for a child at Baltimore Woods Nature Center.